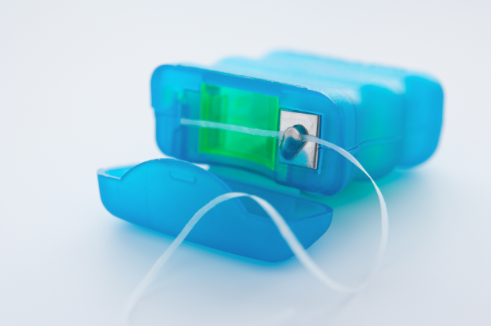 Which Dental Floss is Right for You? Just about everything on the market today comes with a plethora of options. Snack foods, condiments, hair care products, toothpaste, mouthwash…even floss! With so many different choices, which floss is best? First, it’s imperative to note the importance of flossing no matter which floss you select. Then, it’s just as important to learn how to floss correctly. If you have concerns about your flossing method, the next time you’re in for a cleaning or check-up ask Denise, Jennifer, Lore or Dr. Holly for helpful suggestions and tips. Unwaxed floss is the granddaddy of all flosses. It is very difficult to slide between the teeth and often will begin to shred while being pulled through. Waxed floss is the most popular floss sold. That small amount of wax coating makes the entire flossing process so much easier. Flavored floss, generally available in mint or cinnamon, helps your breath and gives your mouth a nice clean feeling. Almost all flavored flosses are waxed. Wide or fine floss. Whenever possible always go with a wider floss. It covers a larger portion of the tooth and gum and cleans more thoroughly. Plus a wider strand won’t cut your gums as easily. Floss picks are perfect for those hard to reach spots and since they are already pre-threaded and disposable they are great for when you can’t floss the regular way. There is really no “right” floss; it all comes down to personal preference. Just remember it doesn’t do any good sitting in your bathroom drawer; you should floss daily for best results. Ellis Dental is now accepting new patients. Please call 314.965.1334 today to schedule an appointment.